Pouneh Kaufman, a program manager in Core Services Engineering and Operations (CSEO), pauses in front of the conference center at Microsoft Ignite 2018 in Orlando. Microsoft employees use Microsoft Teams every day, but most don’t live in it. Company employees have used the collaboration tool to work together on projects, coauthoring, and for having conversations since the product debuted two years ago, but many—because they use Microsoft Outlook to set up their meetings—jump out of it and into Skype for Business when they need to schedule a meeting, have a call, or instant message someone. The company is currently rolling out the Teams meeting add-in to Outlook for all employees and vendors in the company. Once someone gets the add-in, he or she can then start using it to schedule Teams meetings directly in Outlook, which means the meeting will be held in Teams instead of Skype for Business. Meetings already can be scheduled in Teams through the Teams client on desktop, web, and mobile. The deployment of the highly sought after add-in is an important milestone in moving the full employee base from Skype for Business to Teams for all communications—calls, instant messaging, and meetings. Kaufman and the team are announcing the rollout of the Outlook add-in and the company’s upcoming plan to convert fully from Skype for Business to Microsoft Teams at Microsoft Ignite this week. You can check out all the sessions the team is delivering here. The big challenge to all of this? 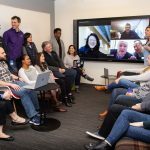 In addition to providing the Outlook plug-in to employees to scheduling meetings, the team is also getting the company’s conference rooms ready for Microsoft Teams. 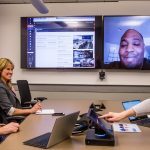 To get there, each room had to be evaluated, including replacing some conference room devices with Skype Room Systems equipment that feature one-touch meeting-join capabilities that integrate with Teams meetings. The team anticipates that conference rooms in Puget Sound will be completely upgraded by mid-October with the rest of the world coming on line by the early end of the calendar year. CSEO wants employees and vendors to share what it’s like for them to use the add-in. As soon as it gets tested on a large scale, the company will start the shift to Teams from Skype for Business for all internal communications. 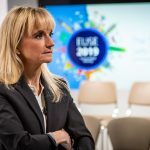 “We have already upgraded 20,000 users to Teams-only,” she says. And it’s clear that Microsoft is all in on using Teams as its platform for employees and vendors to get their work done collaboratively all in one place. Minus a few locations around the world where there is voice over internet protocol telephony restrictions, the move to Teams will mostly take place this fall and winter. The move will be executed by organization (as opposed to physical location) to limit disruptions to inner-team collaboration. Once the upgrade is complete, the company’s focus shifts to improving internal communication and collaboration inside of Teams. That includes using bots to book meetings, to take meeting notes, and to come up with action items for meeting attendees. As for Microsoft Teams, its role as the place where employees live at work will only grow as more and more of the collaboration tools that employees use at work are built into and work out of the platform. To learn more about how CSEO thinks about collaboration at Microsoft, take a look at this IT Showcase case study.